We live in an age where flexible working models and a healthy work-life balance are becoming increasingly important for people. 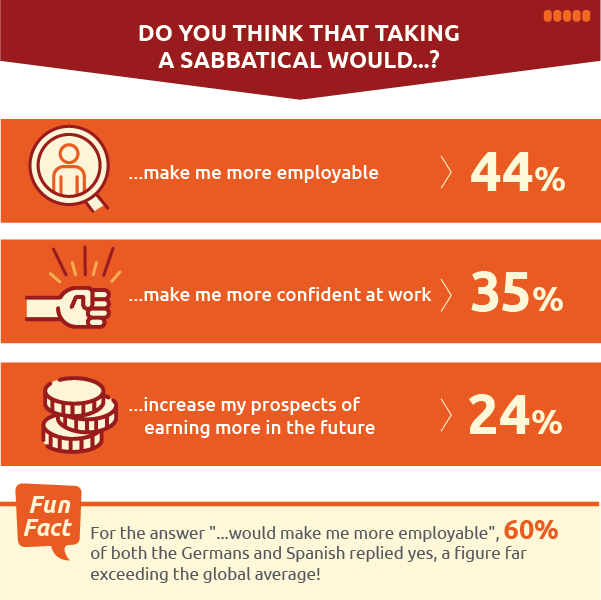 People's interest in taking an extended break from work, known as sabbatical leave, is thus growing accordingly. In our latest survey, we interviewed 12,000 participants from eight countries (UK, Germany, France, USA, Sweden, Italy, Portugal and Spain) on the subject - the results of which are presented here in the form of infographics! 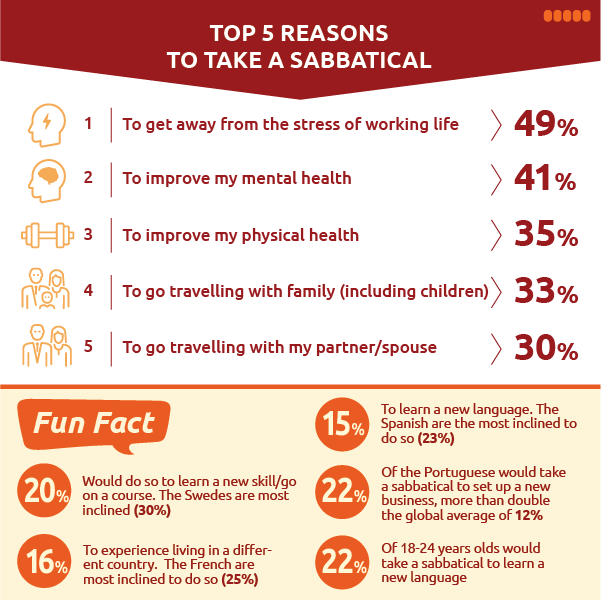 You will also find interesting and useful information about the topic "Sabbaticals" on this page! A sabbatical is usually a long or extended pause from work, which can last from two to 12 months (sometimes even longer). This time can be used for personal development, to carry out voluntary work, to travel or simply to take a break from the stress of work. The meaning of "Sabbatical" derives from the Hebrew word "Sabbath" - the day of the week set aside for rest during which time no work may be done. In the UK, unlike many other countries, employees unfortunately have no statutory right to go on sabbatical leave. However, thanks to the laws on flexible working established in UK labour laws, it is possible for employees to request a longer period of time off work. The conditions for taking a sabbatical have to be individually agreed with the employer and some advanced planning is required. There are different options on how to organise a sabbatical year. There is, for example, the possibility of taking unpaid leave. During unpaid leave, the employee does not receive any compensation and will have to pay their own national health insurance contributions. 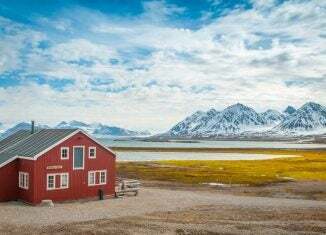 In order to receive some income during sabbatical leave, the employee can agree to a working time account with the employer which, over time, accumulates time deposits. An example of that would be to work part-time, e.g. get paid for a 30-hour week, but continue to work 40 hours. Therefore, 10 hours would be added to the employee's time sheet, which they can redeem when taking a sabbatical to guarantee some income whilst on unpaid leave. 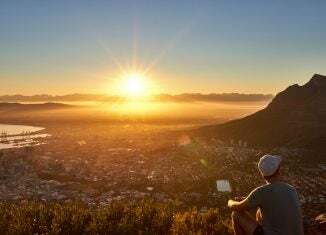 Taking a sabbatical is a great way of escaping from daily life for a year, discovering new things, finding yourself (again) and/or developing further. For many, it is a unique opportunity to re-energise and gain new perspective. But the question is... what can you do in a sabbatical year and how can you make the most of this time? Travelling allows us to discover new horizons, experience new cultures, enjoy a culinary diversity and, above all, it allows us to escape from a familiar environment. Travel fulfills us on all levels. There are many different ways to travel, all of which have a varying influence on our development. 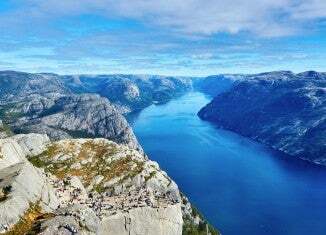 Some people are looking for adventure and challenges, whilst others want to experience different cultures and expand their historical knowledge. Others want to just let themselves drift and live for the day. Sometimes, you will learn a new language on the way. The best journey would involve uniting all the above factors. If you would like to discover new places, but also want to experience life like a local, Work & Travel is the ideal option. Meeting new work colleagues means making new contacts and working will help fund your unpaid leave. It's up to you how you arrange your trip, and whether the focus is more on the travel side or on the work side. 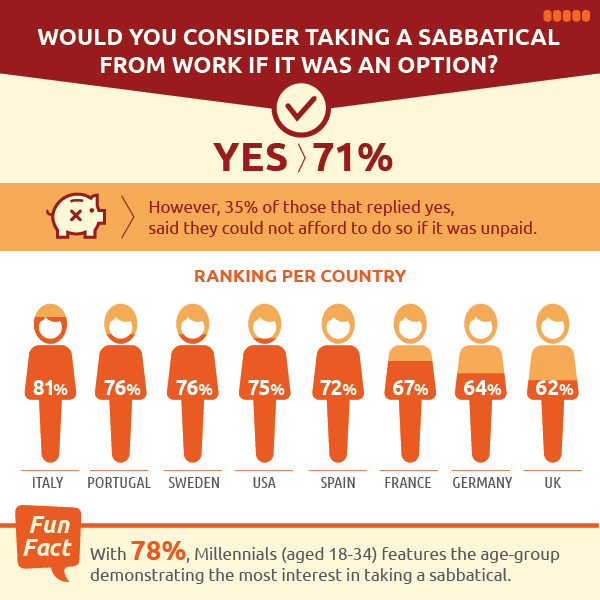 Where to go for a sabbatical?